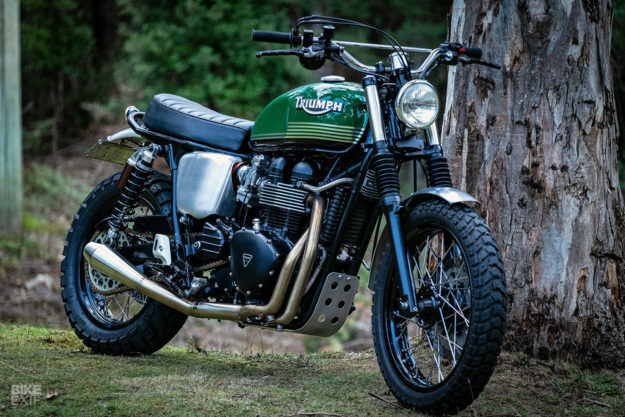 Since its introduction in 2006, the Triumph Scrambler has been a standout in the marque’s modern classics rage. 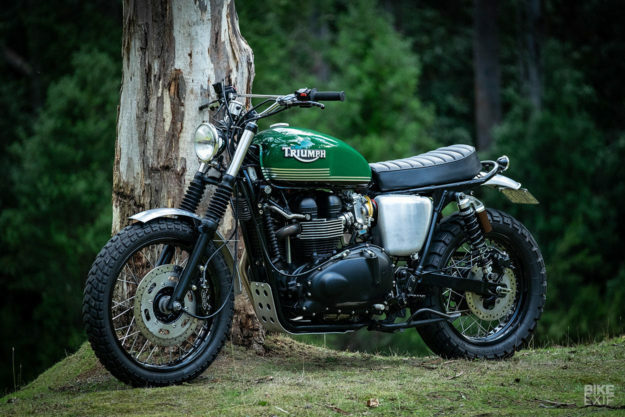 Its easygoing nature and effortlessly cool desert sled vibe have ensured continued popularity. But there’s always room for improvement. 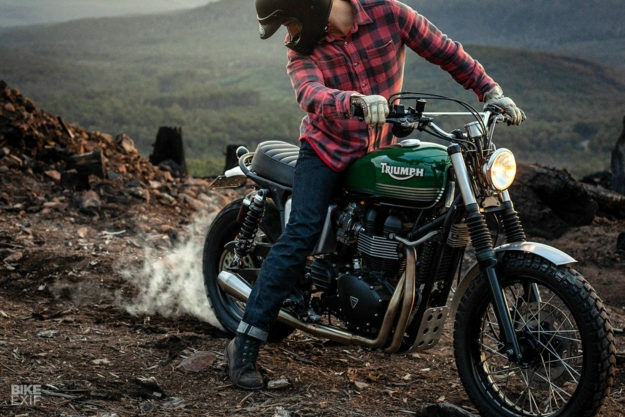 That was Jim Robinson‘s sentiment at least, when he got his hands on a 2008-model Scrambler. Jim’s a British graphic designer and photographer who spent fifteen years in Sydney before recently relocating to Hobart, Tasmania. 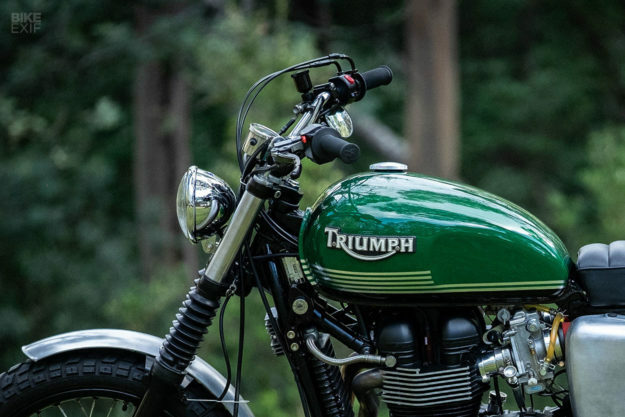 Jim didn’t just want to customize the Scrambler for the sake of change. He was after a factory fresh feel—complete with a side helping of performance enhancements. After months of research, Jim kicked off the project by shipping most of the motor off to Bonneville Performance in the US. The rebuild included 904 cylinders, high compression Wiseco pistons, a flowed and ported head with larger titanium intake valves, and race cams. The carbs were upgraded too, to a pair of 42 mm Mikuni flat slides. 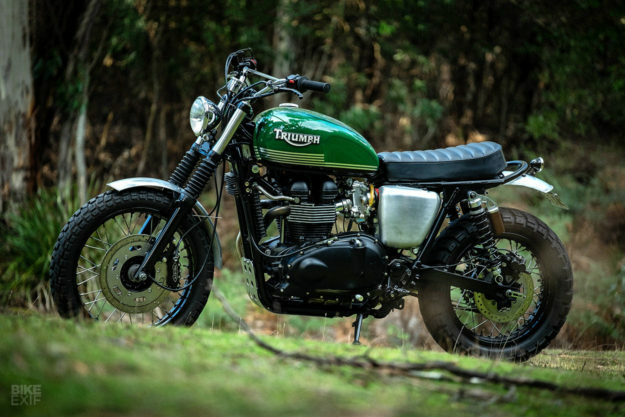 The stock Scrambler’s not known for its handling—and Jim wanted to fix that. On went a set of custom-made Race Tech G3 rear shocks, and in went new Race Tech fork internals. Jim upgraded the wheels too, with German-made Behr rims laced up to billet hubs, now wrapped in Heidenau K60 Scout rubber. The front brake was upgraded too, with a Pretech six-pot caliper. 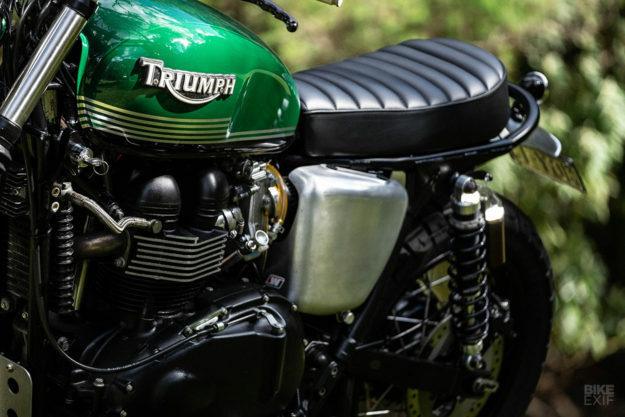 With the Triumph’s performance raised to more-than-acceptable levels, Jim switched to the cosmetics. He started by chopping the rear, then mocking up a new subframe loop with plastic piping that he picked up at the hardware store. He then handed the bike over to a friend: Paul at Drifter Bikes. Paul welded up the final loop, fabricated a seat pan, and added braces to mount it to. He even incorporated a couple of sneaky bungie anchor points near the rear of the seat, for tying down luggage. 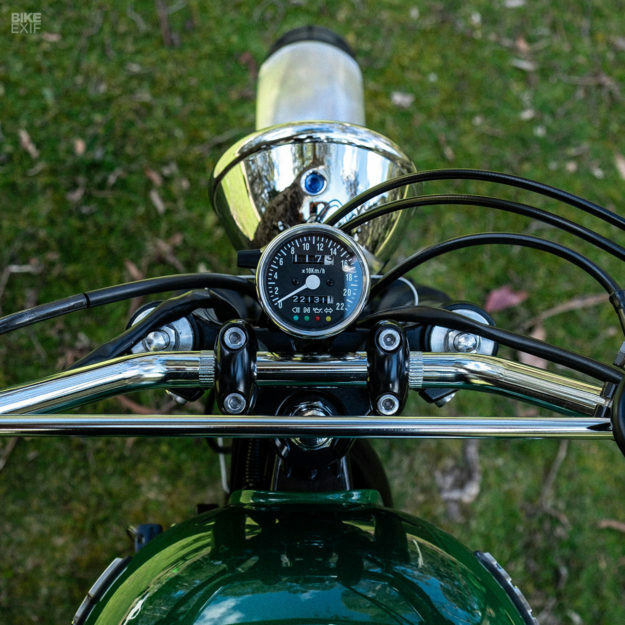 With a shortened rear end and seat, there was no more use for the passenger pegs—so they were binned. 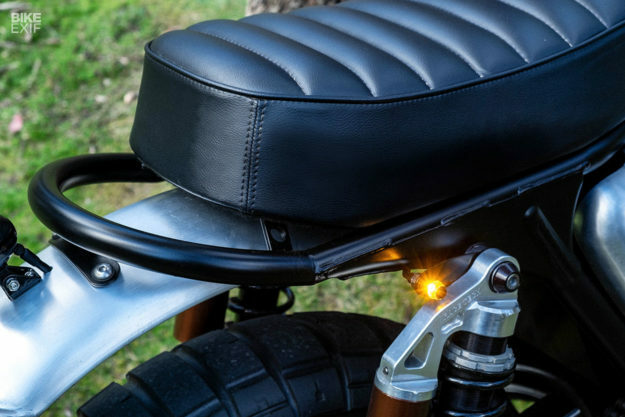 And since the bike was destined for proper off-road use, Jim opted for a vinyl seat cover that he could hose down easily (Tasmania can get a little muddy). 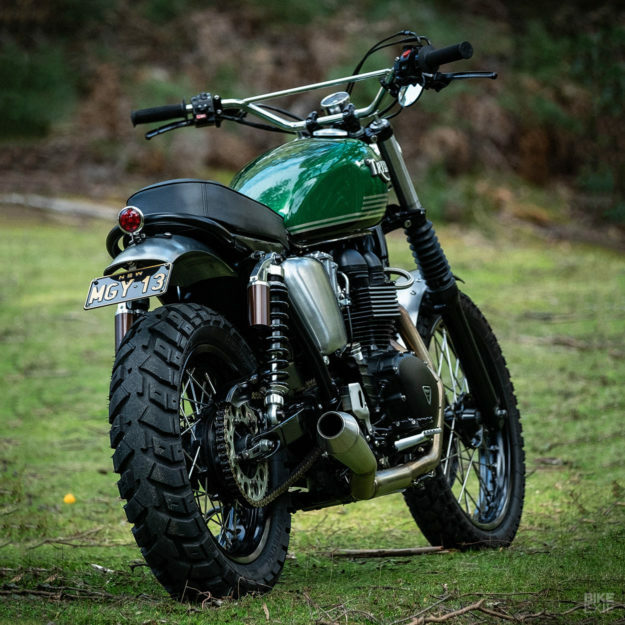 Jim’s Scrambler was now just a few more tweaks away from perfection—starting with a set of aluminum fenders and side covers. He also installed vintage MX bars, a Motion Pro throttle, new cables, a new speedo and a set of Motogadget blinkers. The tail light’s from Motone, and the headlight’s a no-namer off eBay. 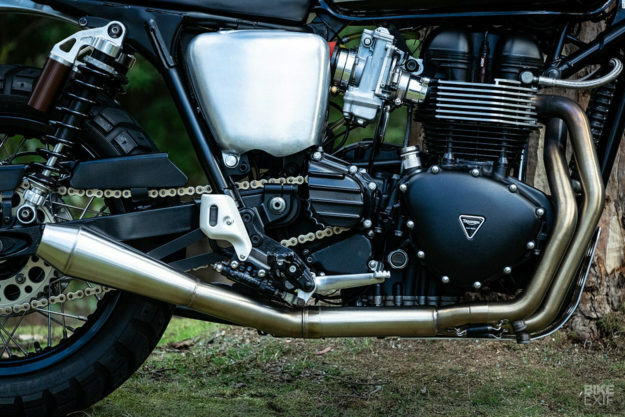 Jim thought the fork uppers looked a bit spindly after he removed the stock headlight brackets, so he sleeved them in stainless tubing to beef them up. The final livery looks simple, but it’s actually pretty complex. 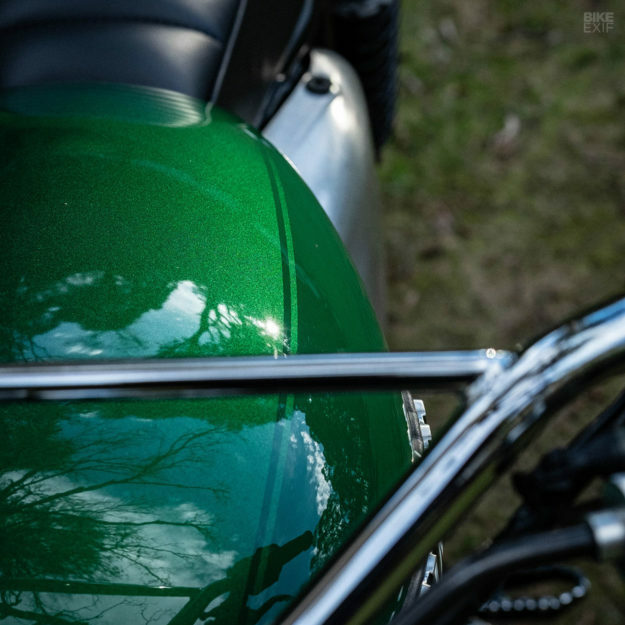 Applied by Sam at Colourfuel, it starts with flat green on the sides, with chrome paint strips that match the fins on the engine. To slim the tank down visually, pearl was added to the top, and solid black sections to the bottom. 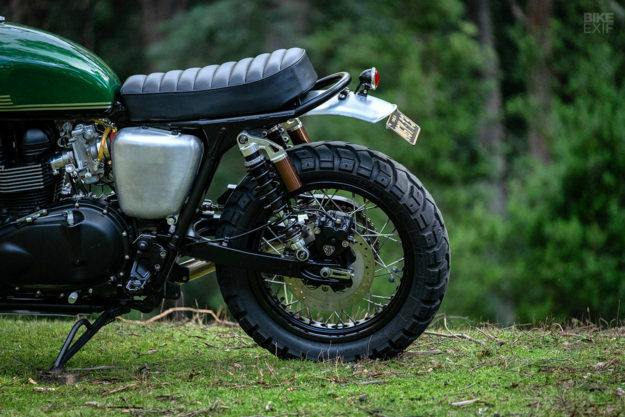 The execution is flawless, giving this scrambler that period-correct feel Jim was after. 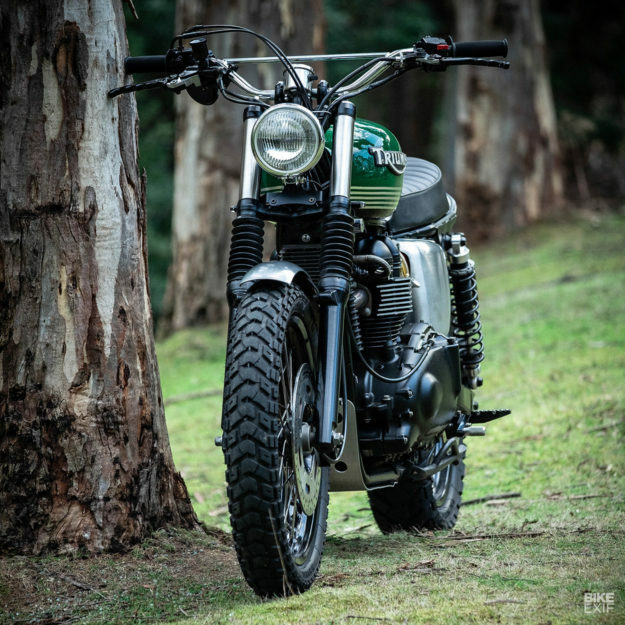 Can you imagine anything better than tearing through the Tasmanian backcountry with this sled? Nope, neither can we. Follow Jim Robinson on Instagram.